Wandering through the Talang Street of the old Phuket town it is impossible not to notice the many fabric houses lining half the street. If you are looking for a more cultural gift or just a souvenir then these fabric shops are the ideal place for a visit. Mainly aimed for locals, these shops stock many types of fabrics used in the traditional Phuket outfit. Amongst the most colorful of these fabrics is the ‘Batae’, a type of Javanese printed or hand painted cloth using wax to make fine patterns before dipping the cloth into different colored dyes. 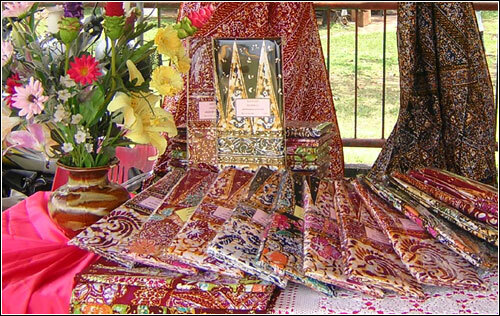 The ‘Batae’ cloth has many uses, from home decoration as table cloth, or can be made into very chic pillow cases as well as playing a vital part in the traditional Phuket life. In the olden days when at home, Phuket ladies wear the ‘Batae’ by draping the cloth as a sarong perfect for the hot, humid weather. Add a lace blouse and these ‘Batae’ sarongs are made instantly fit for a formal occasion, true Phuket style.